We do all the work for you with these golden beauties. Monterey Jack, Cheddar, and Cream Cheeses make these a real crowd pleaser. Simply slide them in the oven on a cookie sheet at 350° for 50 minutes from frozen. Place the steak on the grill pan and cook until well seared on 1 side, 6 to 8 minutes. Turn and sear the second side, again for 6 to 8 minutes. Lower the flame to medium and cook, turning once, 10 to 15 minutes more for rare. To check for doneness, nick, peek, and cheat: make a 1/4-inch cut in the thickest part of the meat and take a peek; it should be slightly less done than you like it. Remove the meat from the fire, cover it loosely with foil, and allow it to rest for 10 minutes before serving. Serve with 1 of the 2 sauces below or the herb butter and Personal Gourmet triple cheese twice baked potatoes. In a small heavy saucepan cook the shallot in the butter over moderately low heat, stirring, until it is softened, add the wine, and boil the mixture until the liquid is reduced to about 1 tablespoon. Whisk in the flour and cook the mixture, whisking, for 3 minutes. Add the milk in a stream, whisking, and boil the mixture, whisking, for 2 minutes. Reduce the heat to low, whisk in the Roquefort, a little at a time, whisking until it is melted and being careful not to let the mixture boil, and strain the sauce through a fine sieve into a bowl. In the top of a double boiler whisk the egg yolks until they become thick and sticky. Whisk in the reduced vinegar mixture and pepper.Place the pan or bowl over a saucepan of simmering, not boiling water. Whisk until mixture is warm, about 2 minutes. The yolk mixture has thickened enough when you can see the bottom of the pan between strokes and mixture forms a light cream on the wires of the whisk. While whisking the yolk mixture gradually pour in the melted butter, 1 tablespoon or so at a time whisking thoroughly to incorporate before adding more butter. As the mixture begins to thicken and become creamy, the butter can be added more rapidly. Do not add the milk solids at the bottom of the melted butter. Season the sauces, to taste, with chopped tarragon, salt and pepper. To keep the sauce warm, set the pan or bowl in lukewarm water. 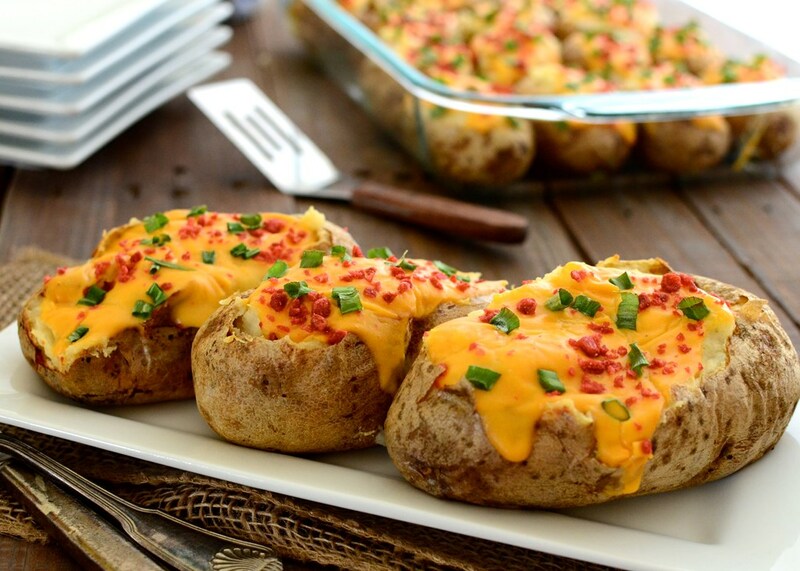 Serve with Personal Gourmets already prepared tripple cheese twice baked potatoes.